David Dickey speaks, as Republican legislators listen. Members of “Iowans for Tax Relief” are accusing Democrats at the statehouse of “being untruthful” about their tax agenda. The group is opposed to the idea of getting rid of a tax deduction which lets Iowans subtract what they paid in federal taxes from their state tax liability. Iowans for Tax Relief member David Overholtzer, a Certified Public Accountant from Council Bluffs, argues Democrats have an “on-going attitude” that taxes should be hiked. Democratic legislators crafted a bill last year which would have gotten rid of this tax deduction while at the same time it would have lowered income tax rates. The bill failed to pass in 2009. David Dickey, a businessman from Packwood who is also a member of Iowans for Tax Relief, suggests Democrats have an “appetite” for tax hikes. House Majority Leader Kevin McCarthy, a Democrat from Des Moines, used one word to dismiss the charges leveled by Dickey and Overholtzer. “Balderdash,” McCarthy said when asked by reporters to respond. A spokeswoman for the governor says Culver has repeatedly said now is not the time to raise taxes. “And Culver has balanced the budget every day he has been Governor without doing so,” said Erin Seidler, the governor’s communications director. 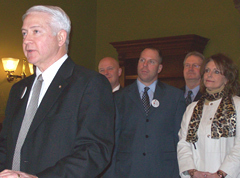 Dickey and Overholtzer spoke this morning at a statehouse news conference organized by Iowans for Tax Relief. Ed Failor, Junior — president of Iowans for Tax Relief — was there, along with nine Republican members of the Iowa House who’re sponsoring bills to enact a series of budget-cutting moves Failor has suggested. For example, Failor is pushing for a ban which would prevent state agencies from hiring statehouse lobbyists.